Even with today's four-inch suspension lift kits, it is still necessary to run a body-lift to clear 35 inch tall tires. The great thing about one-inch body- lifts, is that they do not require any modifications to such things as: A/C lines, gas tank filler tubes, radiator drop down brackets, etc. Our body-lift is 1.25 inches in height --- actually making it .25 inches taller than other 1 inch body-lifts on the market today! This added extension really does make a difference! Each puck is made from 94 durameter solid Durathane® with a contoured top edge and a recessed bottom to prevent slipping. These body lifts are designed to stack on top of the O.E.M. body mounts. All hardware is included. Each TJ kit includes a "transfer case shift lever drop down bracket." 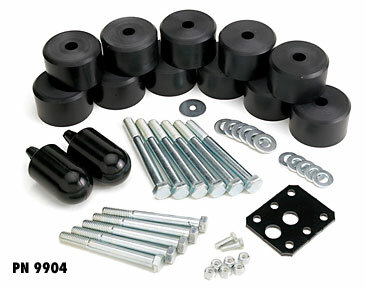 Also included in all YJ and TJ kits are 70 durameter Durathane® bump stops to replace the O.E.M. grill supports. All kits are very easy to install. Note: We recommend using a 1" motor mount lift in conjunction with this body lift kit. Also available for CJ's and YJ's, please contact for prices on these.